ARLINGTON, Texas – Bruno Scaranello sat at a table inside Texas LIVE! on Friday night with Claudio Montanha Jr. to his right and 2010 World Champion Renato Nunes to his left. The 22-year-old has never been to the United States before, but he sure appeared at home joking and laughing with his Brazilian teammates 24 hours before the WinStar World Casino & Resort Global Cup USA, presented by Monster Energy, at a kickoff party. Scaranello arrived to the U.S. for the first time on Wednesday. Now the unknown Brazilian is going to be tasked with playing an instrumental role if Team Brazil looks to win a second consecutive Global Cup. 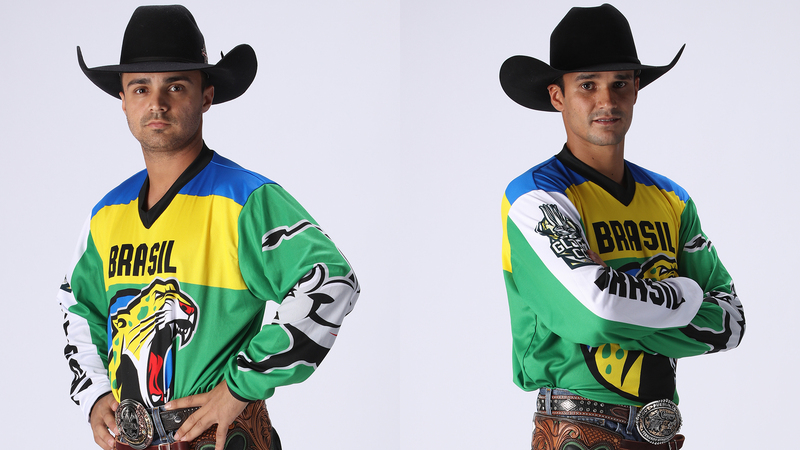 Scaranello and Fernando Henrique Novais are on the Team Brazil roster because of the Global Cup USA ground rules that required each international country competing in the United States to add the three highest-ranked riders in their national standings to their rosters. Scaranello is 59-for-96 (61.46 percent) in his three-year PBR Brazil career with three victories, including wins at Americana and Frutal. What makes Scaranello that much more important for the Brazilians is that he is one of only two left-handed riders on the active roster. Joao Ricardo Vieira is also a lefty, but he is the team’s alternate rider after replacing the other PBR Brazil invite Joao Marcelo Santos. Jose Vitor Leme said he has faith in Scaranello rising to the occasion despite his inexperience. It was less than two years ago when Leme came out of nowhere to win the 2017 PBR World Finals event average and Rookie of the Year. Without any time to get on practice bulls, Scaranello has been spending time with Leme analyzing videos of Leme’s rides in the United States. Scaranello is similar in size, stature and riding style. Scaranello first test comes in Round 1 against Swamp Wreck (11-8, UTB). Seven of the eight rides aboard Swamp Wreck have come from Brazilian-born riders. Leme rode Swamp Wreck for 88.75 points at the 2018 PBR World Finals. Novais is the No. 1 rider in Brazil, but this is not his first time in the United States. The 32-year-old is 5-for-19 (26.32 percent) on the premier series, and he had one qualified ride in each of his first five events. Novais takes on Uncle Keith (4-1, UTB). Novais is 99-for-171 (57.89 percent) in his career in Brazil. Nunes – the second-year Brazilian coach – has spent time in the past couple days learning what kind of bulls fit each of his two inexperienced riders. The 37-year-old knows he will have to find ways to put them in situations to where they can succeed. 2018 World Champion Kaique Pacheco said he has plenty of confidence in Scaranello and Novais. Scaranello has yet to win a championship in Brazil, but he is still in contention with Novais for the 2018 title. The last three PBR Brazil champions have gone to have successful PBR careers – Luciano de Castro (2015), Dener Barbosa (2016) and Leme (2017). Pacheco added that he is excited to see what Scaranello, who is going to remain in the U.S. for the remainder of the first half, can do in North America.